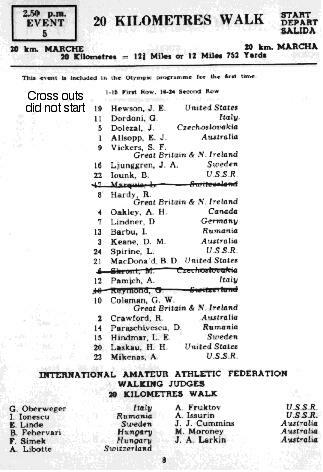 THE judges who adjudicated in the 50 kilometres walking event also officiated here, but they failed to show the same strictness as in the longer race and the standard of walking was certainly far from that expected in an Olympic contest. Twenty-one started in this new Olympic event, which took place in very much cooler conditions than those experienced by the longer distance walkers. 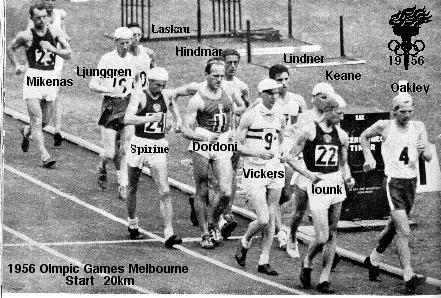 Oakley, of Canada, led going out of the stadium for the first of the 2,000 metres laps; but it was no surprise when he was disqualified. 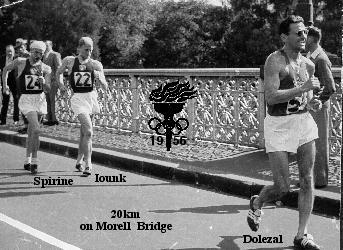 At five kilometres, Dolezal, of Czechoslovakia, was a foot ahead of Coleman and Vickers. of Great Britain, with the Swedish pair, Ljunggren and Hindmar, a yard or so behind. At the half-distance, Dolezal and Ljunggren were the leaders in 45 minutes -36 seconds, Mikenas, one second behind, having four seconds in hand over Coleman and Vickers. Junk and Spirin, of the U.S.S.R., were then Iying ninth, 71 seconds slower than the leaders. It was at this point that the Soviet challenge developed fully, and at 15 kilometres Mikenas had a 13 seconds' lead of Ljunggren, while Spirin had reduced the leeway by coming up to third place. Dolezal tired and, having gone back to fifth place, 20 yards behind Vickers, dropped out shortly afterwards. Spirin, walking fast but far from stylishly, went to the front just before the walkers reached the stadium and was followed m by Mikenas, with Junk a close third to provide the U.S.S.R. with a clean sweep of the medals. Ljunggren made a courageous effort to ward off the mass Soviet challenge and did magnificently, in view of his efforts in the longer race, to finish fourth, and the best stylist of the leading men, Vickers, in his first international race, performed splendidly to occupy fifth place, gaining slightly on Ljunggren in the last five kilometres. The Australian Keane, did well to split split the English trio, of whom Hardy was affected by a caution which caused him to slow down considerably. Seventeen finished, Dolezal, Lindner and Hindmar retiring. Oakley was the only man to be disqualified, although leniency on the part of the judges explains the absence of further enforced withdrawals. 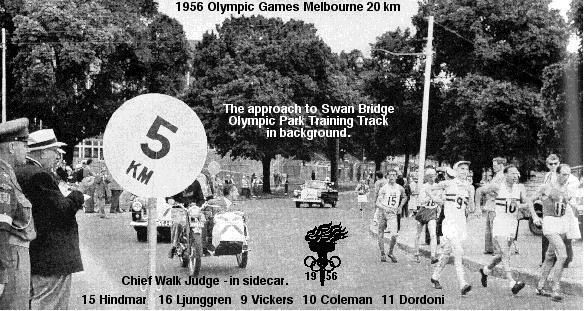 The experiment, for such it must be regarded, of substituting a 20 kilometres road walk for the controversial 10 kilometres track walk proved a success, for it duly attracted the entry from the shorter distance men and was held without the disputes regarding the judging on the method of progression which occurred in the track walks at Wembley in 1948 and Helsinki in 1952. 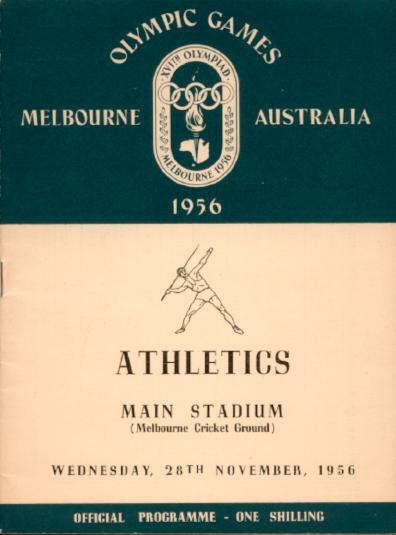 I question whether there would have been quite the same absence of after-race criticism had the Games been held in Europe, where walking is much more popular and where the supporters are more enthusiastic, more partisan and more vocal than it is in Australia. 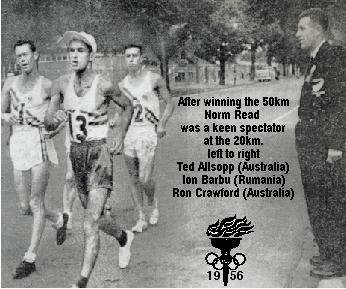 Unquestionably, however, the lengthening of the distance of the sprint walk and its translation to the road has saved the race from disappearing from the Olympic programme.